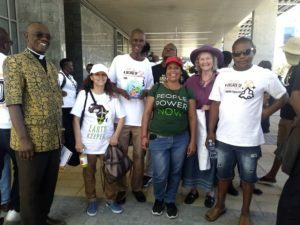 The West Coast Food Sovereignty and Solidarity Forum and the communities of Koekenaap and Lutzville on the West Coast are protesting tomorrow at a meeting between Minister of Mineral Resources, Gwede Mantashe and a mining company, Mineral Sands Resources (MSR) because of their plans to expand mining along the West Coast without any consultation. Despite not honouring the past commitments when it applied to mine more than 15kms of coastline, Mineral Sands Resources (MSR) – a South African subsidiary of Australia’s Mineral Commodities Resources (MCR) – wants permission to mine up to ten additional beaches. MSR is the same company trying to mine titanium on the Wild Coast at Xolobeni, where the community sought legal action last year in a landmark case on their #RightToSayNO to mining. According to Davine Cloete, Chairperson of the West Coast Food Sovereignty and Solidarity Forum, the biggest problem is that MSR purposefully side-step communities, so that they do not have to deal with their issues. Despite numerous efforts to engage the mining company and the South African government on this issue since 2015, both the government and the mining company have ignored their concerns. These communities are experiencing first-hand the impacts of living in a mining area. Surrounding fishing communities have reported that they are no longer able to find any fish on the coastline. And as a result of the growing sand piles at local mine dumps, the area’s agricultural activities are also severely affected. “And since they don’t want to reveal the radiation levels, we can’t say exactly how dangerous this is for our people or our crops. Yet, these and numerous other environmental violations continue to be ignored,” says Cloete. According to Nonhle Mbuthuma of the Amadiba Crisis Committee from Xolobeni who was the opening keynote speaker at the AMI, there are a number of similarities in the issues experienced on the West Coast and what is happening in Xolobeni. When the mining companies want the licenses, they make all kinds of promises of upliftment opportunities. However, in reality, not only do they not deliver on their promises, but they end up destroying the lives of whole communities. “The people in those areas are now worse off than they were before the mines came. They are living in poverty now. They can’t farm the land, nor can they find any fish in the ocean. This is why we continue to fight for our #RightToSayNO to mining,” says Mbuthuma. “Furthermore, it is sad for me, that President Ramaphosa says that mining is in a sunrise phase, when so many people are dying as a result of mining. Think about the thousands of people dying from silicosis and other diseases, or those communities who had every natural resource stripped from them. No, mining is in a sunset phase, even if corporates and politicians do not want to admit it,” says Mbuthuma. For more information about the protest action on the West Coast, contact Davine Cloete on 071-592-2361. It seems that it would be an exceptional mining company that was really interested in the welfare of mining effected communities. So it is up to governments to enforce the applicable legislation but it seems our government is equally uncaring. They should be voted out of office.